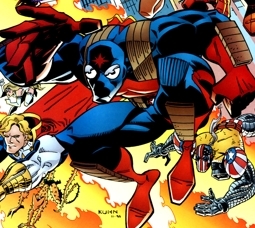 NOTE: Star III created by Erik Larsen, with help from Eric Stephenson and Andy Kuhn. Little is known about the third person to take the mantle of Star. He was hired by the singer Peter Klaptin to take over the role of the vigilante after Chris Robinson was fired from the post and refused to give up the costume. This new Star was installed as the new field leader of Freak Force when the bounty hunters became financed by Peter Klaptin. A team of supervillains led by Chelsea Nirvana dubbed the Frightening Force launched a relentless assault upon the heroes. The skirmish was carried on all the way to Stronghold Penitentiary where Dr. Nirvana arrived to seek vengeance on his daughter. The evil scientist shot the new Star dead during the conflict.